Who will setup the printing? Setup - Do It YourselfFree! Signs Banners Online allow you to setup your upload files free. Learn how here. 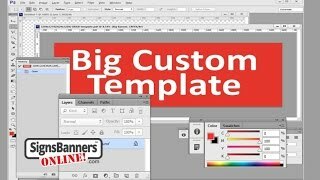 Download our Custom size blank manufacturing templates by choosing options, fittings and features that automatically adjust suited to your custom size input... overlay your graphics and order. This is for those who have their custom size 'print ready file' complete but are not sure how to merge it onto the Manufacturing Template. Once per order. Not available on poster size products. The manfuacturing template is FREE, we put your print ready file onto it for only $1. This $1 item is worktime capped to maximum fifteen minutes. If extensions, changes or modifications are required, other artwork setup fees - do apply. How it works. This items requires ONE custom product in cart. Not available individually or stand-alone. Once per order. Not available on poster size products. Add your choice to cart AND add a custom size product to the cart, then pay. You'll be able to attach the print ready file and the designers will merge your file setup for manufacturing. Ideal for those who need us to make a factory ready file with their print suitable logos and photos. We place your supplied elements into position on the manufacturing template, we make it 'factory ready' and upload for your Instant Preview approval. give your custom size design the best manufacturing results. 2. Perform quality and pre-flight checks and Upload for you. 3. Show you the Instant Preview. Ideal for clients that need creative from start to finish, re-draw logo, photo image cropping, composition and 'factory readiness'. The 2 hour block covers most complex setup projects thru to Instant Preview. 1. Design and Setup your PRINT SUITABLE work with one or two minor changes. Ideal for clients that do not have a relationship with a graphic designer or advertising firm. Concept to Creation processes. All you need to get it done and the completed file is stored for later retrieval and 'purposed' for other industries & repeat orders. Next: - You can attach & send logos, instructions and any current designs you have. Designers complete the work and you approve the design. *After payment, you'll be returned to our Let Us Design Page. Instructions are given via our online Let Us Design pages. You can communicate ONE TO ONE with professional graphic designers. Revisions, alterations or modifications are all available x 30 minute time blocks. If changes or modifications are required past service level or expired worktime, other fees reapply. Not Included: We do not purchase photos on your behalf, please supply them to us. Setup & Artwork: Artwork services are not refundable. Do you need this in other sizes?